Addictive. This boldly spiced mustard will blow you away with its rich Indian-style flavors. Perfect for lamb (think curried lamb salad) and fish. 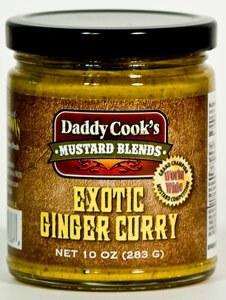 Ingredients: Mustard (Distilled vinegar, water, mustard seed, turmeric, spices, natural flavors), sugar, curry powder, ginger puree, black pepper.